Hick is a terrific and addicting read. It just barrels along, fueled by the adrenaline and enthusiasm of its youthful narrator. It has garnered good reviews from the Los Angeles Times and other newspapers. And it has done so despite being published a few weeks ago as a paperback original; if a book does not come out first in hardcover, it can be an impediment. This fall, the film festival circuit will be introduced to the indomitable Luli McMullen in Hick, the new film made from the acclaimed novel by Andrea Portes, who also adapted the screenplay. The film—directed by Derick Martini—stars Chloë Grace Moretz, Blake Lively and Eddie Redmayne and features Rory Culkin, Anson Mount, Juliette Lewis and Alec Baldwin in supporting roles. Hick is the story of Luli (Moretz), a bright kid from a hick town who’s had enough and strikes out on her own with some “borrowed” cash, a .45 and her wits. On the road, Luli is taken under the wing of a glamorous young grifter named Glenda (Lively), who has experienced worlds barely imaginable to Luli. As the two make their way across the American landscape, they encounter a captivating and dangerous young man named Eddie Kreezer (Redmayne), a disturbing criminal subculture, and some hard truths about what it means to be a young woman on the run, grasping at a future. 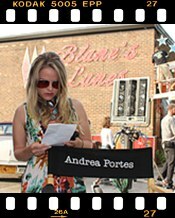 Hick the movie is produced by Lighthouse Entertainment and Taylor Lane Productions, with Stone River Productions serving as executive producer. Though its first-person narrating voice is fast-paced, powerful and unquestionably authentic, Hick is a debut novel. Beyond this voice, what makes the book so extraordinary is that, although all of the worst things imaginable do befall this 13-year-old girl, she is never defeated by them. Luli always fights back; she always resurfaces. 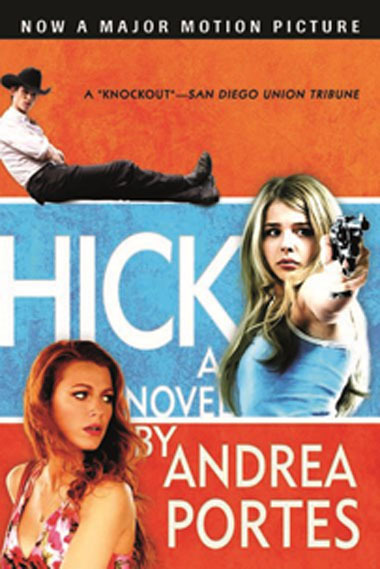 Set as a coming-of-age novel, Hick tracks the real perils that modern teenagers so often face. And it does so with bright wit, energy, and an indomitable spirit. This is a book that will grab the reader from the first page and not let go. And it is written by a woman who is becoming a cultural force in the hippest parts of Los Angeles. Somewhere between Palmyra and Alliance, a beat-up green and white pick-up truck, with a gun rack in the back, pulls up behind me while I’m singing to myself. I look inside and there, in the driver’s seat, sits a skinny bug-eyed cowboy who looks like a turtle. He looks like he must have spent the last ten days straight chasing squealers in the rodeo and hasn’t changed since. He’s got on one of them old fashioned western shirts with a pattern of little rose flowers faded dingy into grey, mother-of-pearl snaps gleaming creamy in a line from his chest down to his jeans, untucked. He’s got a look about him that you wouldn’t be surprised if he just busted out of the nervous hospital. He looks me up and down. He’s got this tone in his voice like he’s got three friends snickering, hunkering down in the cab and this is all a little joke between them. I smile and make a bashful act, bending over myself, trying to let him sneak a peek of my newfound bubbles, hoping for a free ride. I figure I can turn his none-of-your-business into Las Vegas with a little bit of sugar. My age makes him nervous and shamey, cause his eyes keep heading southwards and then back up, guilty. I can tell I can make his eyes swirl and that’s just about all I want to do. This is my new version of my life story. “What’s your dad look like? Maybe I seen him.” He takes off his hat and squints at the brim like he’s inspecting it. There is a silence as he looks me up and down. Then he just starts laughing, real hard and loud, like his make-believe friends just jumped out the back and the dashboard just turned into a bar. I don’t really get his little private joke, but I smile anyways, not wanting to seem dumb or too young or rude even. I resolve to take the reins. “Try thirteen.” I say, real smug. He sneers gritty through the corner of his mouth, like uncle Nipper used to do when the ashtray says he’s been up all night and the bottle of Jack confirms it with two sips left. For once in my life I am struck dumb for words and I don’t like it. I shift my attention to the ground and shuffle my feet through the gravel, praying he’ll give me a lift, at least to Kearney. Later on I’ll think of something good to say, some perfect comeback topped with whipped cream and a smile. He unhitches the lock and stares at me through the window, like he’s daring me. I have never turned down a dare in my life and I’m not about to start now, just cause I can’t think of nothing clever to say to turn me into the starlet of his private movie. I put my head back on my shoulders, real high, open the door and hop in. There is a moment of silence while we both contemplate our new situation. “You got any money?” He doesn’t look at me when he says it. He looks straight ahead, calculating into the sun. Then he peels off onto the road so fast the back of the truck swishes out over the gravel in a C and something in my heart lurches forward, like a roller coaster at the very top, when you can’t see what’s coming but you’re bracing for a steep drop.